Very nice 1/6th plate tintype of a Union drummer standing in front of a fantastic backdrop with soldier, tents, and a cannon along a winding river. The drummer is ready to play his drum and has his sword hanging by his side. This image is much nicer in person than the scan shows. The lighter surface wear that is seen running across the soldiers shoulder area is actually small indentions from the back of the tintype where the photographer etched in his catalog number of 2045, and is not nearly as prevalent in hand as that which the scanner has picked up. Besides those numerical indentions from the back, there are no bends or dents to this image which is really a very, very nice photograph. Housed in a full leatherette case. Please see my other auctions for several other Civil War photographs being listed. Please see pictures as they are part of the description. 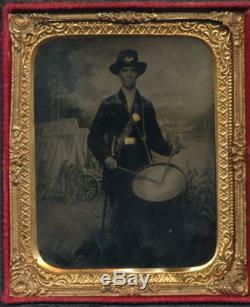 The item "Civil war soldier tintype drummer musician" is in sale since Saturday, July 04, 2015. This item is in the category "Collectibles\Militaria\Civil War (1861-65)\Original Period Items\Photographs". The seller is "gettysburg350" and is located in Winchester, Virginia. This item can be shipped to United States.